I would recommend the course to anyone. It was very useful and the resources were very relevant. I appreciated the insights on using Excel to its greatest extent. The communication design and data cleaning/management presentations were stellar! The information was presented in a very user friendly format. Congratulations to the 2018 Data Institute Graduates! Fourteen students from across the country completed all the requirements of the Institute to earn a Certificate of Completion. Examples of final projects from this and previous RHDI graduating classes can be found on the NOSORH website at https://nosorh.org/data-institute-fact-sheets/. “We’re proud of the Data Institute and all of the projects the students shared. We know that the participants are learning to use data in a way that is meaningful to their organizations.” said Chris Salyers, NOSORH Educational and Services Director. NOSORH would like to thank all of our partners who helped make the institute a success. We particularly appreciate our excellent presenters and technical experts Penny Black (WI SORH), Lara Brooks (OK SORH), and Bryna Koch (AZ SORH) for ensuring engaging and informative sessions. The RHDI is an 8-session online course, over approximately 16 weeks, with live and recorded learning sessions. Each session of the institute builds the basic necessary skills to identify, collect, analyze and communicate data in an effective way – known as the data use process. 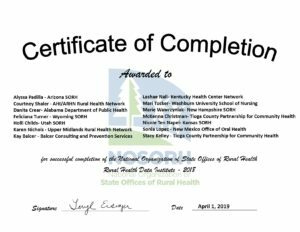 This institute is open to SORH and their rural health partners, including clinical partners interested in expanding population health analytics in their practice. 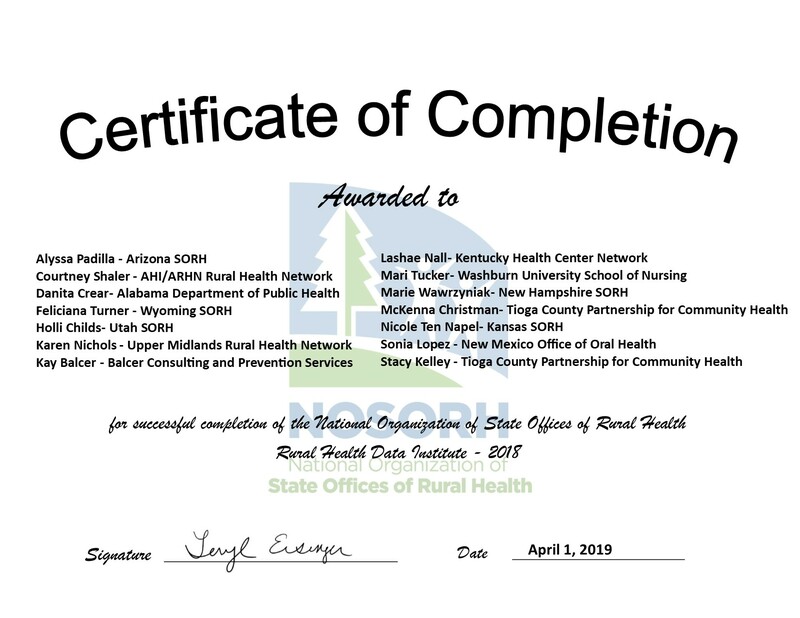 Be on the lookout for registration to the 2019 Rural Health Data Institute that will be even more focused on the needs of future rural leaders. Believe it or not, NOSORH is already planning the 2019 Annual Meeting! The Annual Meeting will take place in Albuquerque, New Mexico, on October 16-17 at the DoubleTree by Hilton Albuquerque. This year’s goal is to provide a more diverse meeting than ever before. NOSORH staff is looking to develop educational strategies that offer a variety of session types to be delivered in a new and exciting way. More information regarding the meeting will be provided via email and posted to the NOSORH website as it becomes available. Discounted rooms are available to meeting participants at the rate of $114 per night plus taxes until September 24, 2019. Use the code “Group Guest NOSORH” to reserve a room online or by phone, Click here or call 800-445-8667. We look forward to seeing you in Albuquerque! If you have questions, please contact Matt Strycker or Trevor Brown. Registration is now open for the brand-new Learning to Lead: The Jim Bernstein SORH Leadership Institute! 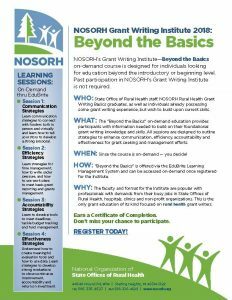 NOSORH designed this 12-part, online Institute exclusively for State Office of Rural Health (SORH) staff in current and future leadership positions. 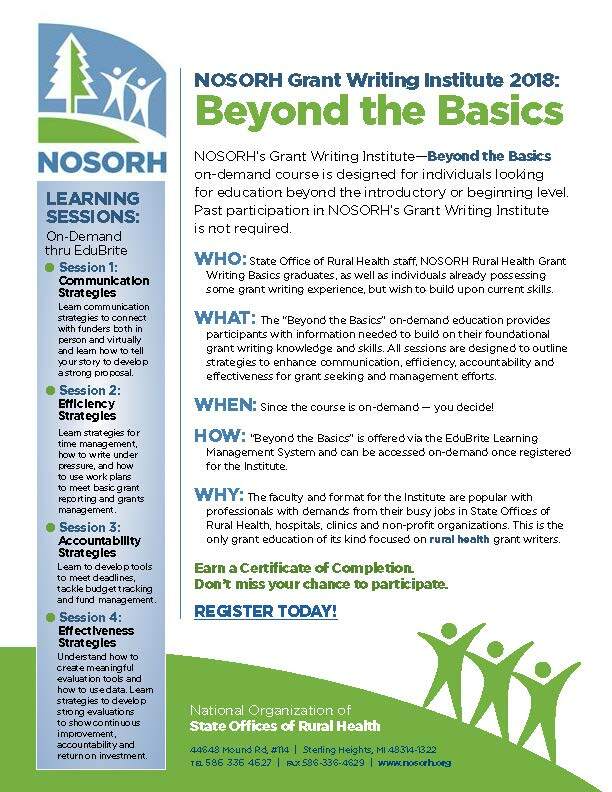 Inspired by the Jim Bernstein Mentoring Philosophy, the sessions provide rural-focused professional development to build the skills, characteristics and knowledge base needed for effective leadership of a SORH. Sessions begin May 16 and will be held every other Thursday from 1:00-2:30 pm ET. A Rural Health Leadership certificate will be awarded to participants who meet all Institute requirements. Check out the Leadership Institute Flyer and Leadership Institute webpage for additional information, including session descriptions, registration information, and pricing. Registration closes Friday, May 10, 2019. Don’t miss this unique development opportunity to enhance your ability to provide influential leadership and management within your State Office! Please contact Tammy Norville for more information. Thanks to the efforts of many, President Trump signed into law the State Offices of Rural Health Reauthorization Act of 2018 in the final hours of the 115th Congress. The bill signing was a culmination of two years of hard work by State Offices of Rural Health, their partners and Hall Render in educating members of Congress and Congressional Committees on the importance of SORHs to our nation’s rural health care. Special acknowledgement to Senator Roberts (KS) for introducing the bill, Representative Mullin (OK) and Representative Schrader (OR) and their staff for supporting SORH. The bill (S. 2278), which is now public law, reauthorizes the SORH grant program for the first time since its creation in the early 1990s. It also authorizes $12.5 million in federal funding for the SORH grant program between fiscal years 2018 and 2022. The bill passed the House on December 19 by a roll call vote of 357-4 and was sent to the President on December 27. The New Year’s Eve bill signing was one of the final Presidential actions of 2018.